In a typical Dubai-manner, building a ferris wheel could not be done without making a statement. The 210m tall ‘Ain Dubai’ (Dubai Eye in English) doesn’t just break the world record – It shatters it! Since the opening of ‘The London Eye’ in the year 2000 at 135m, the race has been on to build even taller observation wheels. In 2006 the ‘Star of Nanchang’ took the record at 160m, followed by the ‘Singapore Flyer’ in 2008 at 165m and the ‘High Roller’ in Las Vegas in 2014 at 168m. 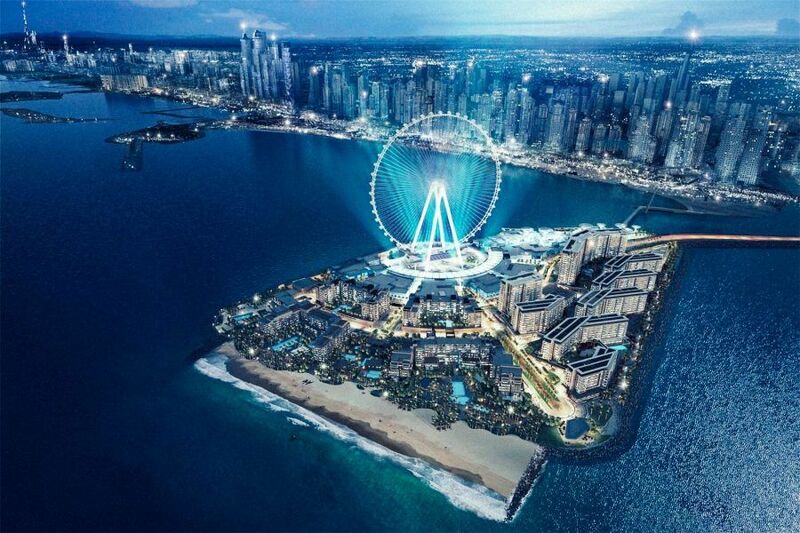 A ‘New York Wheel’ was planned to reach 190m, but the project was scrapped in 2018, possibly due to the fact that Dubai’s wheel would soon surpass the targeted height anyways. Announced in 2013, Ain Dubai was initially planned to open in late 2015, located on a newly finished man-made entertainment island called ‘Bluewaters Island‘ by government-owned real estate development company Meraas. But when the engineering challenge and cost involved soared to new levels, delays were going to be expected. Construction didn’t start until May 2015 at an estimated cost of US$1.6 billion. Hyundai Engineering & Construction and Starneth Engineering were appointed as the primary design and construction contractors. 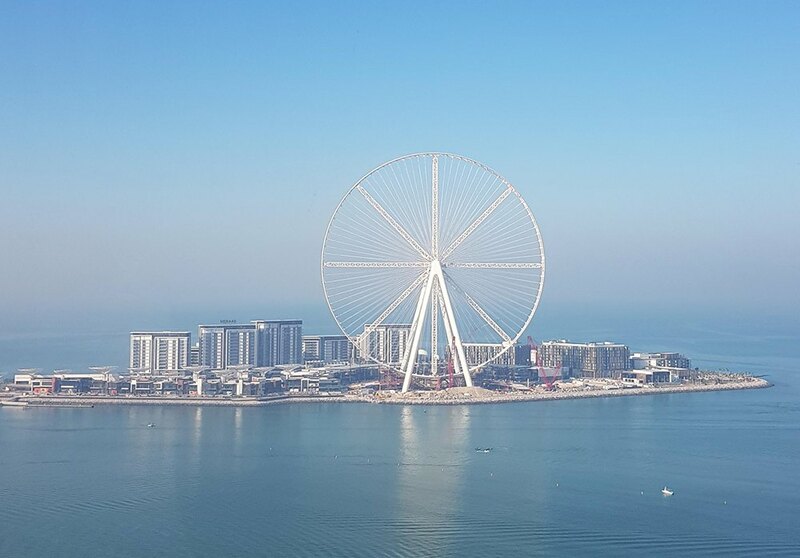 Nonetheless, as of January 2019, the wheel is in the final stages of completion. An opening before 2020 is ambitious but achievable, and certainly the wheel will be a key attraction during the upcoming EXPO 2020 in Dubai. 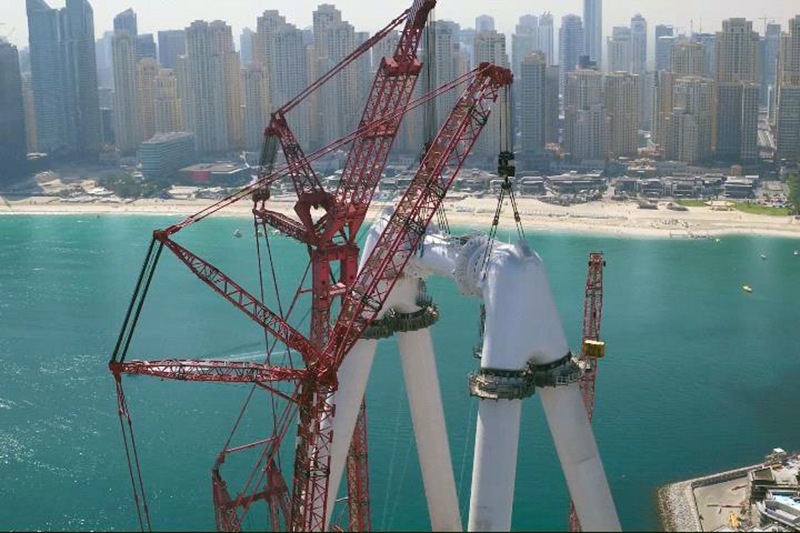 Two 3000-ton lifting cranes were brought from Holland for the initial construction phase, remaining largely idle during the first year of construction. Large support trusses were inserted during construction to prop up the 8 wheel segments until all 192 tensile cables could fully support the outer steel rim like thin spokes in a bicycle wheel. In total around 9000 tons of steel are used create this fairground monstrosity. 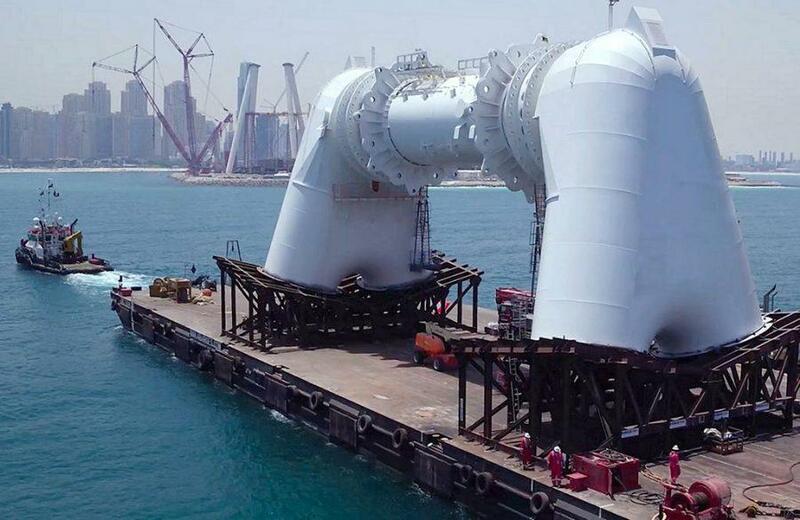 The central spindle and hub unit weighs 1800 tons, spans 40 meters across as it rests on top of four 126m tall legs. Once completed, Ain Dubai will feature 48 capsules and a holding capacity of up to 1,400 visitors at any given time – with a full rotation of the Ain Dubai taking 48 minutes. Also designed and engineered by Hyundai, these double-glazed pods will each measure roughly 10m2 and provide visitors stunning views of the Dubai Marina skyline and Nakheel’s Palm Jumeirah. The units are fully air-conditioned, finished with wooden floors and Corian benches. Popcorn, hotdogs and nachos can be purchased, but even a more refined dine-in service with butler is rumored to be available. Crazy! what are we (mankind) doing?